By now, you know we've pledged our undying love to both Re-Up and Roaming Dragon, and you should know where you can sample both (hint, hint: Thursday at Walrus). As a recap, though, let's revisit the two food trucks. When we first wrote about Roaming Dragon, summer was in the air and Vancouver had just given birth to its much-anticipated/deliberated street food project. Let's be clear: the Dragon offers one of the city's best forms of Western-inflected Asian fare in the city, bar none, and while people worry about authenticity endlessly and needlessly, these guys had to balls to set up at the Richmond Summer Night Market. Here's what we wrote about Roaming Dragon's mantou sliders: "The pork melts away, tender as childhood love, its delicate saltiness nestling with the mantou’s gentle sweetness and rounded out with the slight acidity of the cucumbers. If one needs a reason to fight through the face-to-skewer-stick crowd of the market, this is it." Residing at another point on the street food spectrum is Re-Up BBQ, the only two-person vehicle we've loved more than Herbie the Love Bug. While the city's love for pulled pork has exploded in unadulterated form, let's not forget that Re-Up deservedly sits at the centre of it all, geographically and qualitatively: we have a slow-cooked, porcine king, and we are all Re-Up's humble servants. Here's what we wrote about Re-Up back in August: "The pork is a labour of love, smoked for hours, the taste of hickory lingering in the air well after its consumption. The meat falls apart at sight, tender and luscious, and there is plenty of it: this is a sandwich that is loved and loves back. 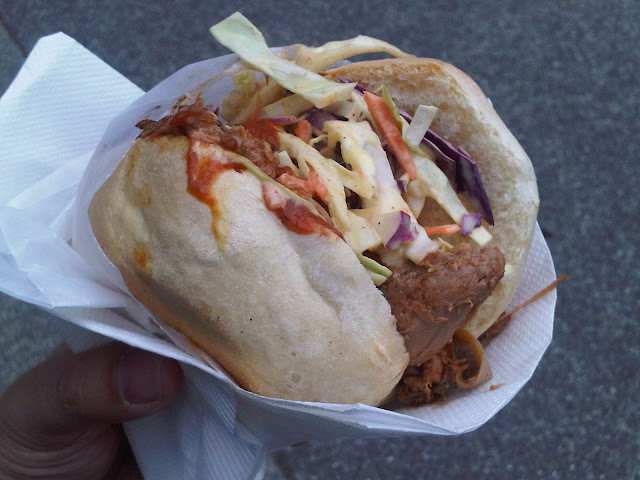 It is topped with a generous amount of fresh coleslaw, and somehow held together by a Portuguese bun in a friendly hug."